Well, it looks like we'll make our trip South with the new Batteries installed and charging seems to be just fine. 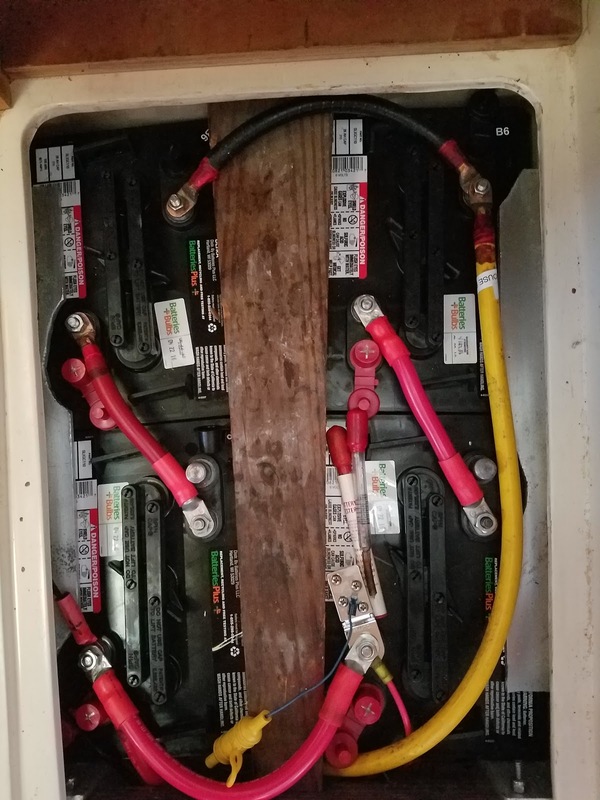 The new Batteries have power post in a slightly different orientation so the old Series / Parallel cables did not fit. A trip to West Marine and Boat Owners Warehouse and I had the bits to make new cables. It took longer to get the bits than to actually make up the cables. But they do look good and the Crimps are top notch. By the end of the day, the new Battery connections were in place, tested and the charging circuits restored. It's mounted on the aft face of the Head bulkhead. It's connected inline with the Earth/Ground wire from the shore power plug. In keeping with my plans to label all new electrical wiring, the GI wires are labeled and everything is tie-wrapped to keep it neat and tidy. On a side note. The Port side cockpit locker is big enough for me to get into and then room for a couple of stowaways! While at it, I cleaned out all of the old junk webbing, lines and hoses before putting everything back together. 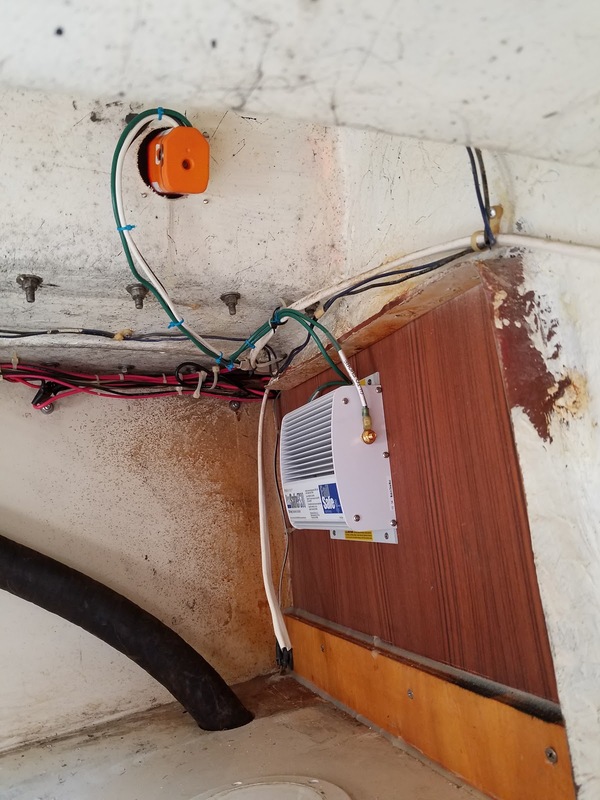 By the time I left the boat afternoon today, the electrics were 100% back together, we're better protected from Stray current that would risk corrosion of our Prop & Shaft etc. So now I just have to tidy up the Cabin before we are ready to load up for our week's trip down to the Bay. So Peggy & I went to the store this afternoon for a Provisioning run. Tomorrow it's just pickup some Diesel - we'll take 15 Gallons with us to cover the planned trip if we have to motor all the way there and back. Tonight, we cooked chicken and prepared 4 meals, tomorrow we'll cook a Pork Tenderloin in the Slow cooker and that will be all of the dinners taken care of. Plan is to leave the dock early Monday before the bridges close for the morning rush hour traffic. 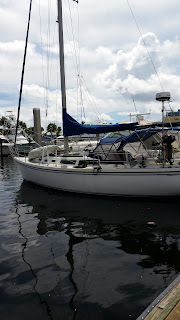 Perhaps this trip we'll get a few videos and pics of us actually under sail. So far the weather forecast is good for the entire week. Keep our fingers crossed.